Popsugar has released a spoiler for the November 2015 Must Have box! I'm happy to see it because it is an ultimately giftable item (and I'm getting two November boxes). This is one of my favorite boxes and last year the boxes over the holidays were fantastic. In fact, the December one was so good, I got three! I did gift the items inside to friends (but I took them all out of the boxes and rewrapped them, I'll be honest). The first spoiler was already released and you can see it here. This is going to be a great box for me, I can tell! 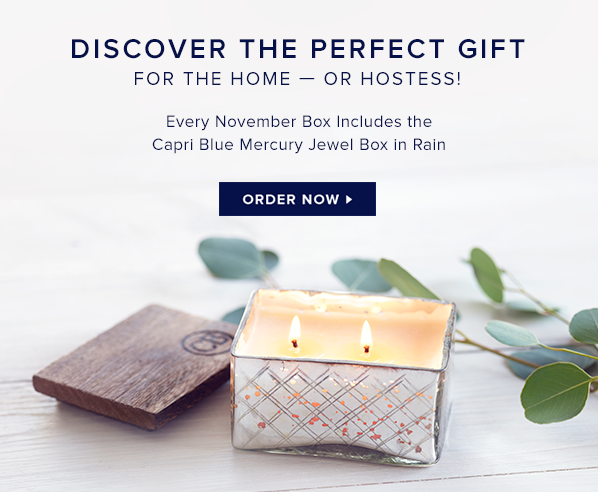 Every box will have a Capri Blue Mercury Jewel Box in Rain! It's made in the USA, has a 25 hour burn time and is 3 3/4"W x 2"H. The scent is Rain which is a "gardenia floral." Once you've burned the candle, you can use it for anything! It's made of glass with a wooden lid. Just my style. Sign up here and get $5 off with code MUSTHAVE5!